cAMP stimulates cell proliferation and Cl–-dependent fluid secretion, promoting the progressive enlargement of renal cysts in autosomal dominant polycystic kidney disease (ADPKD). Intracellular cAMP levels are determined by the balance of cAMP synthesis by adenylyl cyclases and degradation by phosphodiesterases (PDEs). Therefore, PDE isoform expression and activity strongly influence global and compartmentalized cAMP levels. We report here that PDE3 and PDE4 expression levels are lower in human ADPKD tissue and cells compared with those of normal human kidneys (NHKs), whereas PDE1 levels are not significantly different. Inhibition of PDE4 caused a greater increase in basal and vasopressin (AVP)-stimulated cAMP levels and Cl– secretion by ADPKD cells than inhibition of PDE1, and inhibition of PDE4 induced cyst-like dilations in cultured mouse Pkd1−/− embryonic kidneys. In contrast, inhibition of PDE1 caused greater stimulation of extracellular signal–regulated kinase (ERK) and proliferation of ADPKD cells than inhibition of PDE4, and inhibition of PDE1 enhanced AVP-induced ERK activation. Notably, inhibition of PDE1, the only family of Ca2+-regulated PDEs, also induced a mitogenic response to AVP in NHK cells, similar to the effect of restricting intracellular Ca2+. PDE1 coimmunoprecipitated with B-Raf and A-kinase anchoring protein 79, and AVP increased this interaction in ADPKD but not NHK cells. These data suggest that whereas PDE4 is the major PDE isoform involved in the regulation of global intracellular cAMP and Cl– secretion, PDE1 specifically affects the cAMP signal to the B-Raf/MEK/ERK pathway and regulates AVP-induced proliferation of ADPKD cells. Renal cAMP levels are elevated in rodent models of PKD,20–23 and there is reduced PDE expression and activity in cystic kidneys, suggesting that decreases in PDE activity may contribute to elevated cAMP. We show differential isoform-specific roles of PDEs in tissues and primary cells derived from human ADPKD kidneys and in embryonic kidneys of Pkd1-mutant mice. The results indicate that PDE4 is the predominant isoform involved in the regulation of global cAMP and Cl–-dependent fluid secretion. By contrast, PDE1 appears to be compartmentalized within a cellular domain involved in cAMP-dependent activation of B-Raf/MEK/ERK signaling and ADPKD cell proliferation. PDE isoform expression in human ADPKD and normal kidneys has not been well characterized.24 Previously, mRNA for several PDEs was found to be overexpressed in cystic kidneys of PKD mice and rats compared with wild-type; however, protein levels did not correspond to mRNA changes.5,25 In this study, quantitative PCR revealed that pde1A, pde4A, pde4B, and pde4D mRNA are 3.5-, 1.7-, 2.7-, and 2.3-fold higher levels in ADPKD cells, respectively. In ADPKD tissues, pde1A, pde4A, pde4B, and pde4D mRNA levels were also elevated 3.7-, 1.6-, 1.8-, and 3.3-fold respectively, showing symmetry between cells and tissues. Protein levels of PDE isoforms were also compared using isoform-specific antibodies.5 Although mRNA levels were increased, protein levels of PDE1A, PDE1C, and PDE3A were unchanged; PDE3B and PDE4A isoforms were significantly decreased; and PDE4B and PDE4D showed a trend for decreased levels in ADPKD cells and tissues (Figure 1, Supplemental Figure 1). 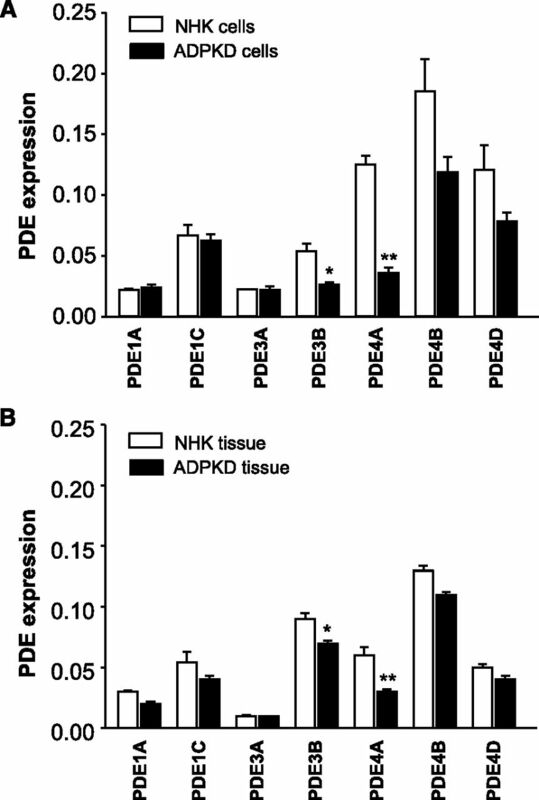 PDE isoform expression in ADPKD and NHK cells and tissues. Protein expression of PDE1, PDE3, and PDE4 isoforms in ADPKD and NHK cells (A) and tissues (B) was determined by immunoblot analysis. Antibodies for PDE1A, PDE1C, PDE4A, PDE4B, and PDE4D (Abcam, Inc.) and PDE3A and PDE3B (Santa Cruz Biotechnology) detected bands of the predicted molecular masses as reported previously5 and in product data sheets. Bands were visualized using enhanced chemiluminescence, and relative band intensity was determined by densitometric analysis using a Fluor-S MAX imager (BioRad). Data (mean±SEM) are PDE band intensity normalized to GAPDH band intensity. (A) Primary cells were cultured from NHK and ADPKD kidneys (n=3 for each). (B) Tissues were obtained from two different NHK and ADPKD kidneys. *P<0.05 and **P<0.01 compared with NHK. We tested the effect of vinpocetine (PDE1), cilostamide (PDE3), and rolipram (PDE4) on basal cAMP levels (Figure 2). ADPKD cells have higher basal cAMP levels compared with NHK cells (Table 1).12 Vinpocetine and cilostamide significantly increased cAMP in NHK, but not ADPKD cells; by contrast, rolipram increased cAMP in both cells. The effect of 8-MeOM-IBMX, a potent PDE1 inhibitor, was similar to that of vinpocetine (Supplemental Figure 2). These results lead us to think that elevated basal cAMP levels in ADPKD are caused by lower activities of PDE1 and PDE3.5 AVP increased cAMP to a higher level in NHK cells than in ADPKD cells (Table 1), as shown previously.12 Inhibition of PDE4 potentiated the AVP effect on cAMP in ADPKD cells, whereas inhibition of PDE1 and PDE3 had little effect. In NHK cells, vinpocetine, cilostamide, and rolipram increased AVP-induced cAMP levels compared with AVP alone. Effect of specific PDE inhibitors on intracellular cAMP levels. ADPKD and NHK cells were treated with 50 µM vinpocetine (Vinpo; PDE1 inhibitor), 10 µM cilostamide (Cilos; PDE3 inhibitor), or 10 µM rolipram (Rolip; PDE4 inhibitor) for 15 minutes. Intracellular cAMP was determined using a cAMP enzyme immunoassay. Data are mean±SEM (n=12 monolayers from three ADPKD kidneys and n=11 monolayers from three NHKs). *P<0.05, #P<0.002, and †P<0.001 compared with control treatment. Cont, control media. cAMP-dependent fluid secretion is responsible for the remarkable size of cysts and enlargement of ADPKD kidneys.2,8 In ADPKD cells, we showed that fluid secretion is driven by CFTR-mediated Cl– secretion.26–28 To evaluate the relative contributions of PDE1, PDE3, and PDE4 on Cl– secretion, short-circuit current (ISC) was measured across ADPKD cell monolayers (Figure 3). The addition of PDE inhibitors increased ISC with an apparent rank order of rolipram>cilostamide≥vinpocetine, similar to their effects on cAMP (Figure 2). Effect of PDE inhibitors on anion secretion by ADPKD cells. Human ADPKD cell monolayers were grown on permeable Transwell supports (Snapwells) and mounted in Ussing chambers for measurement of ISC using a dual-voltage clamp device. Benzamil (10 µM) was added to the apical media to block the epithelial Na+ channel. (A) A typical experiment for the effects of 50 µM vinpocetine (Vinpo), 10 µM cilostamide (Cilos), 10 µM rolipram (Rolip) and 100 µM IBMX when added to the basolateral media. Data (mean±SEM) are changes in steady-state ISC (ΔISC; μA/cm2) after the addition of the drug. (B) Bars represent the steady-state ISC in a composite of four experiments. Basolateral addition of 10 nM AVP, a positive control for cAMP activation, increased ISC across ADPKD cell monolayers (ΔISC=2.1±0.1 µA/cm2, n=3). *P<0.05 compared with zero in a one-sample t test. Pkd1m1Bei mouse metanephric kidneys represent a useful ex vivo intact kidney model for studying fluid secretion and cyst formation in ADPKD.29 Kidneys from Pkd1+/+, Pkd1+/−, or Pkd1−/− mice were dissected on embryonic day 15.5 and cultured as previously described.29 Kidneys were monitored for 4 days for the presence of tubular dilations, and the fractional cyst area was measured.29 Under basal conditions, renal explants increased in size and continued ureteric bud branching and tubule formation in culture; however, there were very few tubule dilations in the absence of cAMP.29 IBMX and rolipram increased cyst-like dilations in Pkd1−/− kidneys and surprisingly induced cyst formation in Pkd1+/− kidneys (Figure 4, A–D). PDE inhibitors increased cyst-like dilation in Pkd1−/− kidneys in the rank order of rolipram>cilostamide>vinpocetine (Figure 4E), similar to their effects on cAMP and anion secretion by human ADPKD cells (Figures 2 and 3). The rolipram effect was similar to that of IBMX; 8-Br-cAMP maximally induced cyst-like dilations. Effect of PDE inhibition on cyst-like tubule dilations in Pkd1 embryonic kidneys. Representative photographs of embryonic day 15.5 (E15.5) kidneys from Pkd1m1Bei (Pkd1+/+, Pkd1+/−, and Pkd1−/−) mice placed in culture and treated with 100 μM IBMX (A, B) or 10 μM rolipram (C, D). Kidneys were photographed using a 2× objective for 4 days, and fractional cyst area was determined by measuring cystic area/total cross-sectional area of the kidney (minus the pelvis) as described previously.29 *P<0.05 compared with zero in a one-sample t test. #P<0.05 compared with Pkd1+/+ and Pkd1+/− kidneys. (E) A comparison of the cystic index of Pkd1−/− kidneys treated with 5 μM vinpocetine (Vinp), 10 μM cilostamide (Cilos), 10 μM rolipram (Rolip), 100 μM IBMX, or 100 μM 8-Br-cAMP for 4 days. *P<0.05 and †P<0.001 compared with the control-treated contralateral kidney. In ADPKD, cAMP agonists stimulate the B-Raf/MEK/ERK pathway leading to cell proliferation.7,30 PDEs can regulate cross-talk between the cAMP and ERK pathways and thereby modulate the effect of an agonist on cell proliferation.31,32 As such, we determined the effect of PDE inhibitors on ERK phosphorylation and proliferation of human ADPKD cells. AVP increased ADPKD cell proliferation by 50% but had no effect in NHK cells (Figure 5), a signature phenotypic difference established by mutations in the PKD genes.7,28,30 Despite having very little effect on cAMP levels and Cl– secretion, PDE1 inhibition caused a 60% increase in ADPKD cell proliferation. Unexpectedly, PDE1 inhibition also caused a small increase in the proliferation of NHK cells and converted the antiproliferative effect of AVP on NHK cells into a strong mitogenic response. PDE3 inhibition also induced ADPKD cell proliferation, whereas NHK cell proliferation tended to decrease below control. PDE4 inhibition, which had the greatest effect on global cAMP and Cl– secretion, had very little effect on the proliferation of ADPKD cells and decreased NHK cell proliferation. Effect of isoform-specific PDE inhibitors on basal and AVP-induced cell proliferation. (A) ADPKD and (B) NHK cells were treated with vehicle (Cont), 10 nM AVP or PDE inhibitors (5 μM Vinpo, 10 μM Cilos, or 10 μM Rolip) ±AVP for 24 hours. Cell proliferation (mean±SEM) was normalized to Cont, set to 100%. AVP stimulated the proliferation of ADPKD cells, but not NHK cells, consistent with previous results.28 PDE1 inhibition with Vinpo had the greatest effect on ADPKD cell proliferation. Moreover, Vinpo caused a small but significant increase in NHK cell proliferation and completely reversed the response to AVP, such that AVP induced cell proliferation, mimicking the response of ADPKD cells. Statistical analysis was determined by ANOVA and Student–Newman–Keuls post-test. †P<0.001 and *P<0.05 compared with controls. #P<0.05 compared with AVP alone, and @P<0.05 compared with Vinpo and AVP alone. Cilos, cilostamide; Cont, control media; Rolip, rolipram; Vinpo, vinpocetine. Similar to its effect on ADPKD cell proliferation, PDE1 inhibition also had a tendency to increase P-ERK and potentiated AVP-induced ERK phosphorylation (Figure 6). AVP alone failed to stimulate P-ERK in NHK cells; however, PDE1 inhibition increased P-ERK and caused AVP to strikingly induce ERK phosphorylation, suggesting that the mitogenic effect of PDE1 inhibition was mediated by ERK activation (Figure 6). This effect of PDE1 inhibition on ERK phosphorylation and proliferation of NHK cells was confirmed using nicardipine, a chemically unrelated PDE1 inhibitor (data not shown). Effect of PDE inhibitors on ERK phosphorylation. ADPKD and NHK cells were treated with control media (Cont), 5 µM vinpocetine (Vinpo), 10 µM cilostamide (Cilos), or 10 µM rolipram (Rolip) individually or in combination with 10 nM AVP for 15 minutes. (A) Levels of P-ERK/total ERK were higher in ADPKD cells treated with AVP or PDE inhibitors; however, these changes were not statistically different from Cont. PDE1 inhibition with Vinpo significantly enhanced AVP-induced ERK phosphorylation. (B) AVP had no effect on P-ERK in NHK cells, consistent with previous results.18,28 However, PDE1 inhibition caused AVP-induced ERK phosphorylation in NHK cells. Nicardipine, a chemically unrelated PDE1 inhibitor, increased P-ERK levels by 50%, and the combination of nicardipine and AVP increased P-ERK by 3-fold compare with Cont (n=2), confirming that PDE1 inhibition reversed the AVP effect on ERK activation. P-ERK/total ERK (mean±SEM) are relative to Cont (set to 1). Statistical analysis was determined by ANOVA and Student–Newman–Keuls posttest. †P<0.001 and **P<0.01, compared with Cont; @P<0.05 compared with AVP or Vinpo alone. Loss of PC function alters intracellular Ca2+ metabolism in renal cells leading to cyst formation. Previously, we showed that intracellular Ca2+ determines the mitogenic response to cAMP at the level of B-Raf, a kinase upstream of the MEK/ERK pathway.18,19 Here, we explored the possibility that B-Raf, PDE1, and A-kinase–anchoring proteins (AKAPs) might associate in a complex that could regulate the proliferation of cyst epithelial cells. 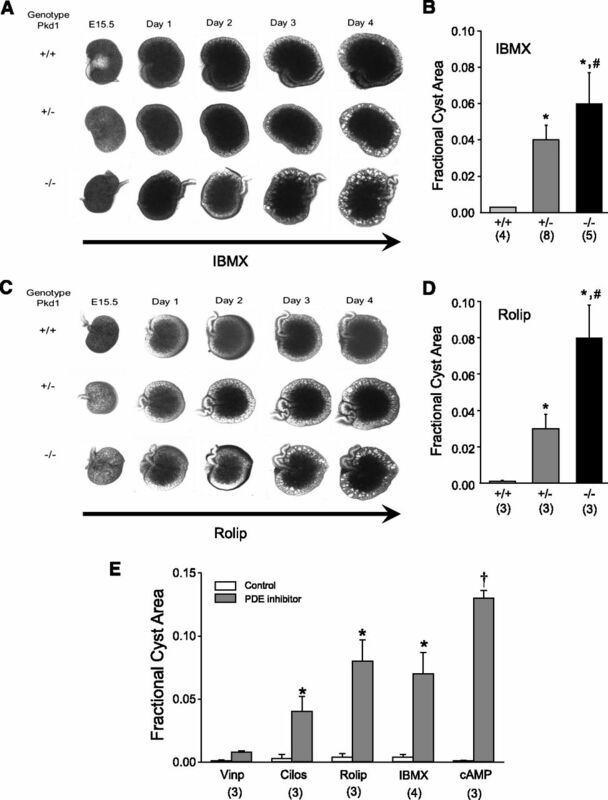 Immunoprecipitation experiments demonstrated that B-Raf interacts with PDE1A and that AVP increased the interaction in ADPKD cells but had no effect in NHK cells (Figure 7, Supplemental Figure 3). PDEs can associate with scaffolding proteins, such as AKAPs, to promote compartmentalization of the cAMP signal to downstream pathways, and these complexes modulate ERK signaling by securing Raf in the vicinity of MEK.33,34 AKAP79 has been shown to interact with components of the cAMP pathway, including AC5/6, PKA, and PDE4C and PC2, in primary cilia of renal cells.35 In the absence of AVP or cAMP, AKAP79 and B-Raf were not appreciably bound in either ADPKD or NHK cells (Figure 8, Supplemental Figure 4). After AVP or cAMP treatment, AKAP79 and B-Raf associated significantly in ADPKD cells, but not in NHK cells. PDE1 inhibition with vinpocetine was insufficient to induce an AVP-mediated interaction between B-Raf and PDE1 in NHK cells (Supplemental Figure 5), indicating that additional changes contribute to the difference in the AVP response. When taken together, these data support the view that PDE1, AKAP79, and B-Raf form a complex in ADPKD cells and that AVP increases this interaction. 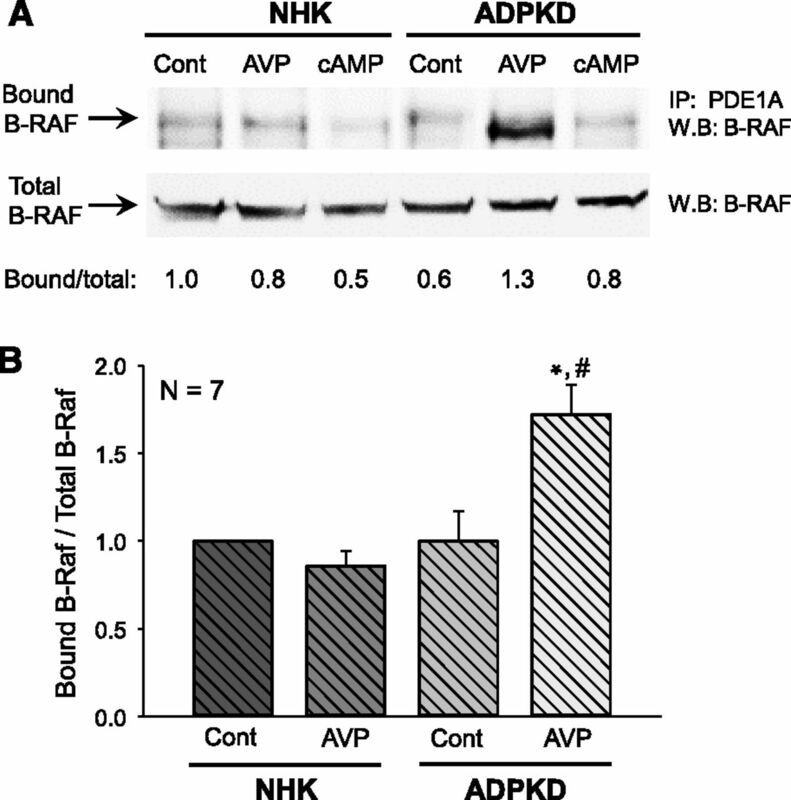 Effect of AVP and cAMP on PDE1A/B-Raf interaction in ADPKD and NHK cells. (A) ADPKD and NHK cells were treated with control vehicle (Cont), 10 nM AVP, or 100 μM 8-Br-cAMP (cAMP) for 15 minutes, and cell lysates were prepared. Cell lysates (300 µg of protein) were incubated with PDE1A primary antibody and magnetic beads to pull down PDE1A. Immunoprecipitated B-Raf was detected by Western blot using a B-Raf antibody (Bound B-Raf). Cell lysates were analyzed for B-Raf expression (Total B-Raf). (B) Summary of the effect of AVP on the interaction between PDE1A and B-Raf. Bars (mean±SEM) represent the relative Bound B-Raf/Total B-Raf levels normalized to NHK cells in Cont (set to 1.0). *P<0.02 compared with control and #P<0.05 compared with NHK cells treated with AVP. 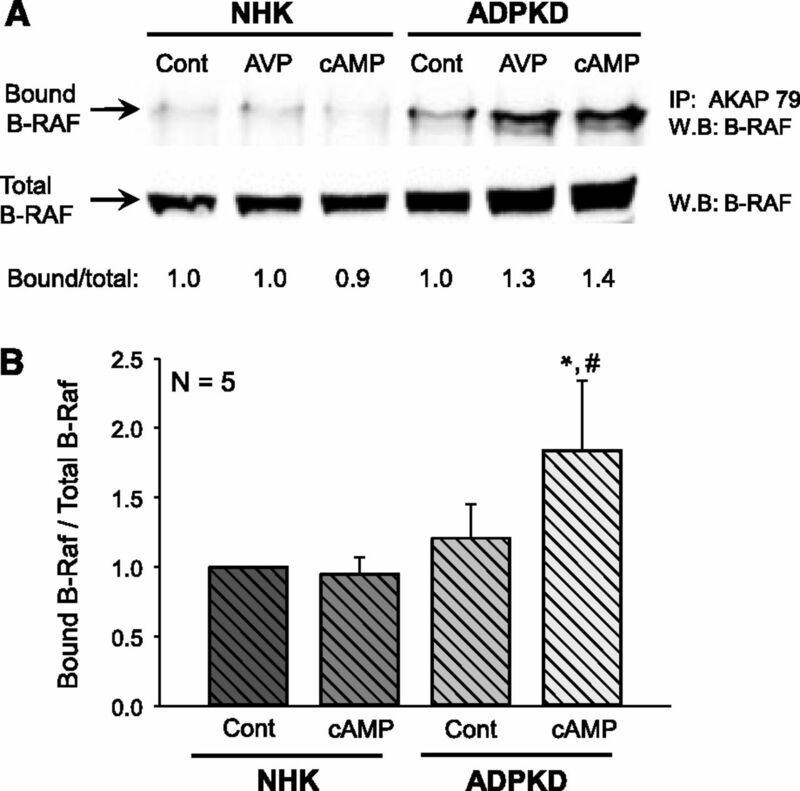 Effect of AVP and cAMP on AKAP79/B-Raf interaction in ADPKD and NHK cells. (A) NHK and ADPKD cells were treated with control vehicle (Cont), 10 nM AVP, or 100 µM 8-Br-cAMP (cAMP) for 15 minutes, and cell lysates were prepared. AKAP79 was immunoprecipitated with beads conjugated to a primary AKAP79 antibody, and the levels of B-Raf were detected by Western blot analysis (Bound B-Raf). Cell lysates were also analyzed for Total B-Raf. (B) Summary of the effect of cAMP on the interaction between AKAP79 and B-Raf. Bars are relative Bound B-Raf/Total B-Raf levels, normalized to NHK cells (set to 1.0). *P<0.05 compared with Cont, and #P<0.05 compared with NHK cells treated with cAMP. We report evidence obtained in human ADPKD tissues and cells implicating different PDE isoforms in the promotion of cell proliferation and fluid secretion. Steady-state cAMP content of cells cultured from ADPKD cysts was approximately double that found in cells from normal kidneys (Figure 2). Although this observation was in agreement with rodent models of hereditary PKD, in which renal cAMP levels were shown to be higher than normal,20–22,36 the cell culture studies suggest that there is also an intrinsic difference in cAMP regulation, leading to higher cAMP levels in ADPKD cells. This, together with our earlier work showing that global PDE inhibition increased cAMP to similar levels in ADPKD and NHK cells,12 led us to explore specific PDE isoform expression levels and activities in NHK and ADPKD kidneys to determine the underlying basis for this effect. There are >50 isoforms in the PDE superfamily that regulate cAMP and cGMP levels. It is believed that this structural diversity of PDE isoforms and their capacity to interact with scaffolding proteins are important for compartmentalization of the cAMP signal by hydrolyzing cAMP within specific cellular domains. PDE4, PDE7, and PDE8 hydrolyze cAMP exclusively, whereas PDE5, PDE6, and PDE9 hydrolyze only cGMP. Certain isoforms (PDE1, PDE2, PDE3, PDE10, and PDE11) are dual-substrate PDEs and hydrolyze both nucleotides.24,32,37,38 In kidneys, PDE1, PDE3, and PDE4 account for most overall PDE activity, with PDE4 having the highest activity.24,25,39 In rat IMCD cells, PDE1 inhibition enhanced AVP-dependent cAMP levels and increased cGMP, indicating that PDE1 plays a dual role by regulating cAMP and cGMP in these cells.40 By contrast, PDE4 was found to be the predominant isoform for cAMP metabolism in extracts from suspensions of renal cortical tubules.39 Because PDE1 is regulated by Ca2+ and concentrations of Ca2+ vary widely within the cell, PDE1 may be the major PDE involved in hydrolyzing cAMP within cellular domains with high Ca2+, and the relative contribution of PDE1 to total PDE activity may depend on cellular conditions. Previously, PDE3 and PDE4 isoforms and overall PDE activity were shown to be reduced in kidneys of Pkd2WS25/– mice compared with wild-type mice.5 Here, we found that the protein levels of PDE3B and PDE4A are reduced in the tissues and cells from human ADPKD kidneys compared with normal kidneys (Figure 1). Although ADPKD kidneys at or near end stage may have contributing factors associated with CKD, the differences in PDE expression between tissue and cultured cells were remarkably similar. Assessment of functional activity of individual PDEs, evaluated with specific inhibitors, revealed that PDE4 had a greater effect on basal and AVP-stimulated cAMP levels than PDE1 or PDE3 (Figure 2, Table 1). Differences in PDE expression may effect the response of inhibitors; however, despite lower PDE4 in ADPKD cells, rolipram caused the largest increase in cAMP levels. Inhibition of PDE4, but not PDE1, stimulated Cl– secretion by ADPKD cells (Figure 3) and promoted cyst-like dilations in Pkd1−/− mouse embryonic kidneys (Figure 4). Although PDE3 has been shown to be functionally coupled to Cl– secretion by shark rectal glands41 and pig trachea submucosal glands,42 we found that PDE3 inhibition had only a modest effect on Cl– secretion by ADPKD cells, similar to human bronchial epithelial cells.43 These findings point to PDE4 as the principal isoform controlling the cAMP pool involved in Cl–-dependent fluid secretion by ADPKD cells. PDE1 inhibition caused significant increases in ERK activation and ADPKD cell proliferation (Figures 5 and 6), despite having only minimal effects on global cAMP and Cl– secretion (Figures 2 and 3). These findings support the possibility that PDE1 is the principal isoform preventing cAMP activation of B-Raf and ERK. Previously, we found that AVP stimulated ERK and ADPKD cell proliferation at a concentration that was 10,000× lower than was required to elicit an increase in global cytosolic cAMP and Cl– secretion.28 We hypothesized that there was functional compartmentalization of the V2 receptor/cAMP signaling and the B-Raf/MEK/ERK pathway, such that low concentrations of AVP were mitogenic in ADPKD cells. Although the mechanism underlying cAMP signaling to the ERK pathway has been difficult to elucidate, there is evidence that scaffolding proteins hold Raf, MEK, ERK, and PKA within a membrane domain.33,34 The original concepts for AKAP signaling complexes were tested with AKAP79 (AKAP150 in mouse). AKAP79 is a scaffolding protein capable of binding and anchoring the PKA regulatory subunit and signal transduction proteins and can regulate their activity.44,45 Choi et al. found that AKAP79 (AKAP150) was expressed within a signaling complex comprised of PDE4C, AC5/6, PKA, and PC2 within the primary cilia of mouse renal cells and that disruption of cilia formation led to increased cAMP levels.35 We found AKAP79 was part of a signaling complex with PDE1 and B-Baf and an elevation in cAMP increased the association of these proteins in ADPKD cells, but not NHK cells (Figures 7 and 8). These data provide an explanation for how PDE1 could be the central isoform involved in the regulation of cAMP within membrane domains involved in B-Raf/MEK/ERK activation and cell proliferation. cAMP stimulates Cl–-dependent fluid secretion in both NHK and ADPKD monolayers2,26,27,46–48; however, cAMP increases ERK activation and cell proliferation only in ADPKD cells.7,18,19,49 PDE1 inhibition caused an increase in basal proliferation of NHK cells and together with AVP induced a strong mitogenic response similar to that observed in ADPKD cells (Figure 5). Currently, the mechanism for the AVP mitogenic response remains unclear. PDE1 inhibition increased basal and AVP-dependent activation of MEK/ERK signaling in NHK cells (Figure 6); however, it did not cause a significant interaction between PDE1 and B-Raf (Supplemental Figure 5). Importantly, PDE1 knockdown in zebrafish induced pronephric cysts,50 demonstrating a key role for PDE1 in cystogenesis. PDE1 is the only isoform that is stimulated by Ca2+, and it controls both cAMP and cGMP levels. Previously, we showed that lowering Ca2+ in NHK cells changed their response to cAMP from antiproliferative to mitogenic, a phenotypic switch in which NHK cells mimicked ADPKD cells.18,19 Although the mechanism by which PDE1 inhibition causes AVP to stimulate NHK cell proliferation remains unclear, it is possible that under normal conditions Ca2+/CaM activates PDE1, keeping cAMP levels low within a cellular domain involved in B-Raf signaling. Pharmacologic inhibition of PDE1 (Figures 5 and 6) may increase cGMP levels.5 cGMP inhibits renal cGMP-gated cation channels in collecting duct cells, which are permeable to divalent cations, including Ca2+.51 Therefore, reduced PDE1 activity may decrease intracellular Ca2+, causing a phenotypic switch that enables cAMP activation of B-Raf– and ERK-mediated cell proliferation, similar to functional loss of PCs52,53 or restricted Ca2+ entry by channel blockers or chelating agents.18 As such, this could represent a positive feed-forward mechanism by which the loss of PC function lowers intracellular Ca2+, leading to PDE1 inhibition and elevated levels of cGMP that cause further lowering of intracellular Ca2+ in ADPKD cells. In summary, PDE4 appears to be the main isoform involved in the regulation of basal- and AVP-stimulated cAMP levels, limiting the pool of cAMP responsible for activating Cl–-dependent fluid secretion by ADPKD cells. By contrast, PDE1 appears to be part of a multiprotein complex comprised of AKAP79 and B-Raf that compartmentalizes the cAMP signal to the MEK/ERK pathway. Accordingly, its inhibition would lead to the proliferation of ADPKD cells. These results reinforce the importance of PDE isoforms in the regulation of cAMP within specific domains of human renal epithelial cells. A better understanding of the distinctive roles of PDEs in shaping the cAMP response to AVP could lead to the development of new strategies to target cAMP within specific functional domains to slow cyst growth in ADPKD without the complication of water diuresis. ADPKD kidneys (n=18) were obtained from the surgery department at KUMC and hospitals participating in the Polycystic Kidney Research Retrieval Program with the assistance of the PKD Foundation (Kansas City, MO). The average age of the patients at the time of the nephrectomy was 52 years (range, 45-63 years), and most patients were at or near ESRD. ADPKD cell preparations were most likely from PKD1 patients because 85% are caused by PKD1 mutations and individuals with PKD2 mutations have a milder phenotype and later onset of ESRD (median age, approximately 54 years for PKD1 mutations versus 74 years for PKD2 mutations).54 NHKs unsuitable for transplantation were obtained from the Midwest Transplant Network (Kansas City, KS). Kidneys obtained from living cadavers (average age, 44 years; n=12) were not transplanted because of abnormalities in the renal vasculature or poor perfusion characteristics on a renal perfusion pump. Primary cell cultures were prepared by the PKD Research Biomaterials and Cellular Models Core at KUMC as previously described.27,28 Briefly, ADPKD cell cultures were prepared from multiple surface cysts ranging in size; NHK cells were cultured from sections of the cortex and outer medulla. Primary cultures of ADPKD cells and NHK cells stain Dolichos biflorus lectin, indicating the cultures are enriched in collecting duct cells.7 The protocol for the use of surgically discarded kidney tissues complies with federal regulations and was approved by the Institutional Review Board at KUMC. Cell lysates (300 µg of protein) were incubated with primary antibodies to PDE1A or AKAP79 (SC-10764) and magnetic beads (BioMag; Polyscience, Warrington, PA), coated with secondary anti-rabbit antibody (Bangs Laboratories, Fishers, IN), to pull down PDE1 or AKAP79, respectively. After overnight incubation on a rocking surface at 4°C, the beads were isolated with a magnet and washed three times with ice-cold PBS. Western blot analyses of the immunoprecipitated proteins were performed as previously described.18 Immunoblots were probed with antibodies for PDE1A or AKAP79 to determine immunoprecipitation efficiencies (Supplemental Figures 3–5) or with B-Raf (SC-166) to analyze the interaction of B-Raf with PDE1 or AKAP79 at 1:100 dilution. Total B-Raf in cell lysates was also determined and used for normalization (bound B-Raf/total B-Raf). Proteins were visualized by using an enhanced chemiluminescence system. Band intensity was detected and quantified by a Fluor-S MAX Multi-Imager system. ADPKD and NHK cells (5×104) were seeded into individual chambers (1.9 cm2) of 24-well plates in DMEM/F12 containing 5% FBS, ITS, and P/S. After 48 hours, the medium was changed to 1% FBS to reduce the rate of basal growth, and cells were allowed to grow for an additional 5 days. Serum was reduced to 0.002% for 24 hours before the start of the experiment.12,57 Cells were incubated for 15 minutes with 10−8 M AVP alone or with PDE isoform-specific inhibitors (PDE1, 50 µM vinpocetine; PDE3, 10 µM cilostamide; and PDE4, 10 µM rolipram) or a broad-spectrum PDE inhibitor 3-isobutyl-1-methylxanthine (IBMX; 100 µM) for 30 minutes±AVP for 15 minutes. After the treatment period, media were removed, and cAMP was extracted with 80% methanol-20% water mixture. cAMP content was determined with an enzyme immunoassay system (Amersham Pharmacia Biotech, Little Chalfont, UK), as previously described.12,28 Differences in cAMP levels expressed as picomole per milligram of protein were qualitatively similar to cAMP differences when expressed as picomole per monolayer12; therefore, cAMP was represented as picomole per monolayer. ADPKD and NHK cells (2×104) were seeded into individual chambers (1.9 cm2) of 24-well plates in DMEM/F12 containing 1% FBS, ITS and P/S. Serum was reduced to 0.002% when the cells were approximately 50% confluent, and then cells were allowed to grow for an additional 24 hours. Cells were treated with 25 ng/ml EGF, 10−8 M AVP alone, or PDE isoform-specific inhibitors 5 µM vinpocetine, 10 µM cilostamide, or 10 µM rolipram or with 100 µM IBMX in the presence or absence of AVP for 24 hours. Each treatment was performed in quadruplicate. After 24 hours, cells were harvested by trypsinization, counted using an automated cell counter (TC 10; Bio-Rad, Hercules, CA), and normalized to the control. Pkd1m1Bei mice were originally obtained from the Mutant Mouse Regional Resource Center (University of North Carolina) and were stabilized onto a C57BL/6 background (>10 backcrosses). The mice were genotyped using PCR primers and TaqMan Chemistry (Applied Biosystems, Foster City, CA) real-time PCR as previously reported.29 Embryos were collected at embryonic day 15.5. Metanephric kidneys were dissected under sterile conditions and transferred to Transwell filters (24-mm, 0.4-μm pore size; Corning, Corning, NY) within a six-well culture plate as previously described.29 In brief, metanephroi were cultured at an air-fluid interface with DMEM/F12-defined culture medium (supplemented with 2 mM l-glutamine, 10 mM HEPES, 5 μg/ml insulin, 5 μg/ml transferrin, 2.8 nM selenium, 25 ng/ml prostaglandin E, 32 pg/ml T3, 250 U/ml penicillin, and 250 μg/ml streptomycin). Organ cultures were maintained in a 37°C humidified CO2 incubator for up to 4 days. Then 8-Br-cAMP (100 μM), 10 μM rolipram, 10 μM cilostamide, 5 μM vinpocetine, and 100 μM IBMX were added to the culture media after 24 hours. Cross-sectional surface area (SA) of the kidney and cyst-like tubule dilations were determined using image analysis software. Fractional cyst area was calculated as the ratio of total cystic SA divided by the total SA of the kidney. All animal experimental protocols were approved by the KUMC Institutional Animal Care and Use Committee and followed the National Institutes of Health Guide for the Care and Use of Laboratory Animals. AVP, FSK, vinpocetine, cilostamide, rolipram, and 8-MeoM-IBMX were purchased from Sigma-Aldrich (St Louis, MO). IBMX was purchased from Calbiochem (San Diego, CA). Vinpocetine, cilostamide, rolipram, and IBMX were dissolved in DMSO as 1000× stocks. Equivalent concentrations of DMSO were added to the media of control and treatment groups. The concentration of vinpocetine used in cAMP and short-circuit current experiments was 50 μM, whereas the concentration was reduced to 5 μM in cell proliferation and embryonic organ culture assays because of toxic effects with long-term treatment. Data are expressed as mean±SEM. Statistical significance was determined by one-way ANOVA and Student–Newman–Keuls post-test for multiple comparisons or unpaired t test for comparison between control and treated groups. C.S. Pinto is presently an employee of the Otsuka Pharmaceutical Company. We thank Dr. Jared Grantham for assistance in the preparation of the manuscript. This work was supported by grants from the National Institutes of Diabetes and Digestive and Kidney Disease (R01-DK081579 to D.P. Wallace) and by the PKD Foundation (C.S. Pinto and J.P. Calvet). This research was also supported, in part, by funds provided by the Allen Foundation Trust, Milwaukee, Wisconsin (D.P. Wallace). Portions of this work have been previously published in abstract form (J Am Soc Nephrol 21: 523A, 2010 and J Am Soc Nephrol 22: A31, 2011). The opinions, findings, and conclusions herein are those of the authors and do not necessarily represent those of the Allen Foundation Trust or any of its programs. This article contains supplemental material online at http://jasn.asnjournals.org/lookup/suppl/doi:10.1681/ASN.2015010047/-/DCSupplemental.